The thing I love about shepherd pie is that there are so many ways to go... You can mix the veggies, use different meats, make it vegetarian, go with regular or sweet potatoes or a combo.... Experiment a little with your cravings and see where it takes yo, you might be surprised! Sauté the carrot and celery with the olive for a couple of minutes. Add the turkey some salt and pepper. When he meat starts to brown, add the stock so it doe snot dry out. Cook from few more minutes and add the tomato pasted and the peas and and make it is all nice combined. Taste and adjust seasoning. Meanwhile place in a large pot the potatoes and cauliflower covered with water.Bring to boil for 15-20 minutes unify soft nought that it will break when you pick with a fork. Keep 1/2 cup of cooking liquid and drain the rest. 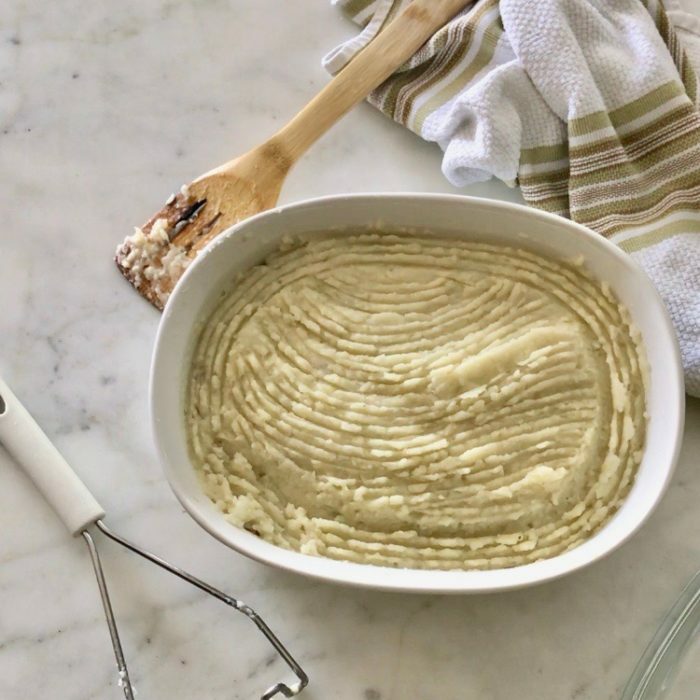 Using a potato masher, mash it all tougher adding olive oil, salt and pepper and some of the cooking liquid ( you may not need the whole thing) until you get a smooth consistency. Transfer the meat-veggies mix into a deep baking dish and layer the mash cauliflower-potatoes on top. Either refrigerate until dinner or place in the oven for 20 minutes and enjoy! !